This is a sponsored post written by me on behalf of Mirium. All opinions are my own. 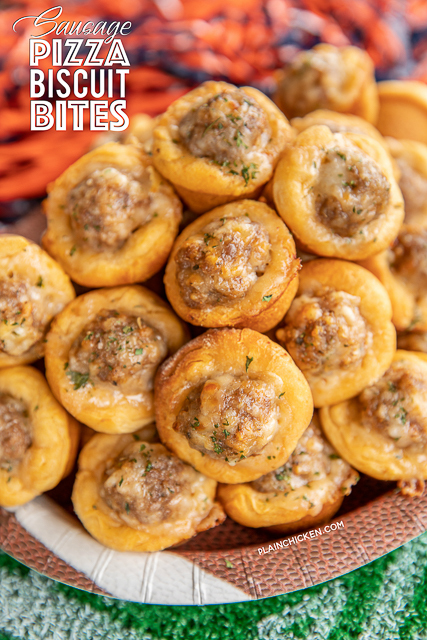 Sausage Pizza Biscuit Bites - only 4 ingredients! Sausage, spaghetti seasoning, mozzarella cheese and biscuits. Can add bell pepper, onion or mushrooms to the mixture too. Ready to eat in about 15 minutes. These things fly off the plate at our parties and tailgates! Serve with some warm pizza sauce for dipping. Everyone LOVES this easy appetizer recipe. Anyone else counting down the days to the Super Bowl? Come on, I can't be the only one!! It is the last time we get to enjoy yummy tailgating food until the Fall. 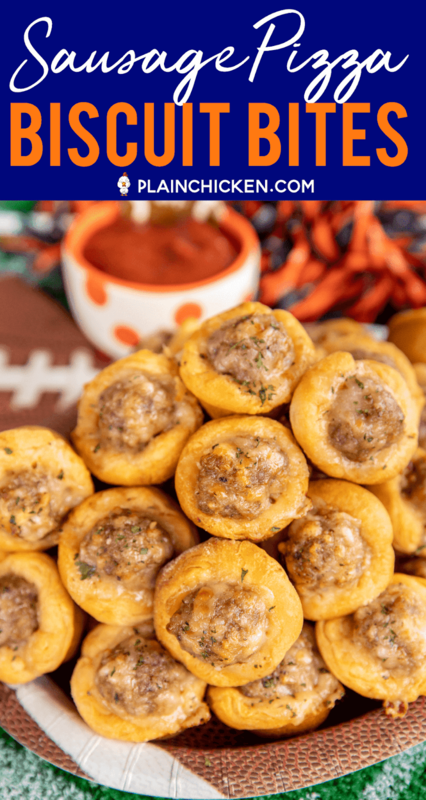 I always go all out with all of our favorite football foods for the big game, like these Sausage Pizza Biscuit Bites. OMG! These are SO good! I could make a meal of these things! With only 4 ingredients, they are a breeze to make! Perfect for watching the big game! Now, I have a love hate relationship with tailgate food. I absolutely love all the different dips and finger foods, BUT I hate how I feel after eating junk food all day. 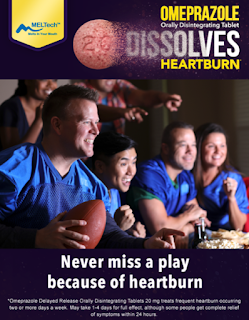 I don't eat it very often, so I end up with heartburn. Since I'm not going to stop eating tailgate food, I had to find a solution. Fortunately, I found Omeprazole Orally Disintegrating Tablets. Taking Omeprazole Orally Disintegrating Tablets allows me to enjoy all the yummy football foods confidently. YAY! You can take the Omeprazole Orally Disintegrating Tablets with you to the tailgate, and you don’t need water to take it. It dissolves on your tongue to provide heartburn relief for up to 24 hours. It has a nice strawberry flavor, too! 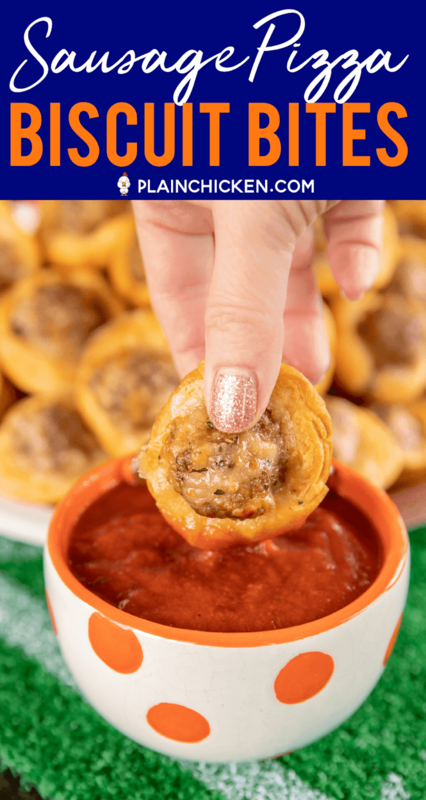 Not only are these Sausage Pizza Biscuit Bites delicious, they are super easy to make. They are ready to eat in about 15 minutes! If you like to make recipes ahead of time, you can mix up the sausage mixture and finish assembling them when you are ready to bake. Please note that the sausage is not precooked. You use the sausage raw and it bakes along with the biscuits. I promise it will be fully cooked after it has baked. 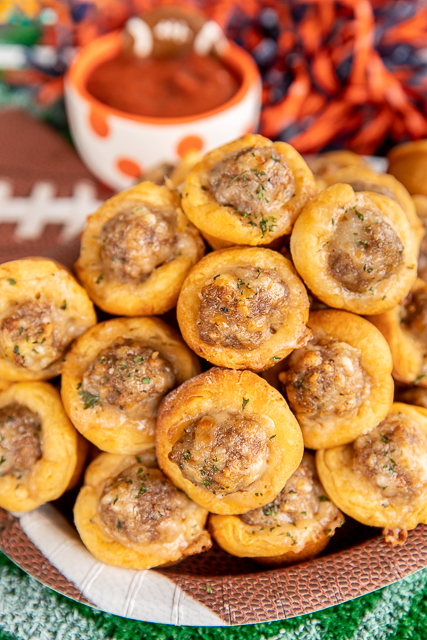 These Sausage Pizza Biscuit Bites scored a TOUCHDOWN on taste in our house. Seriously delicious!! 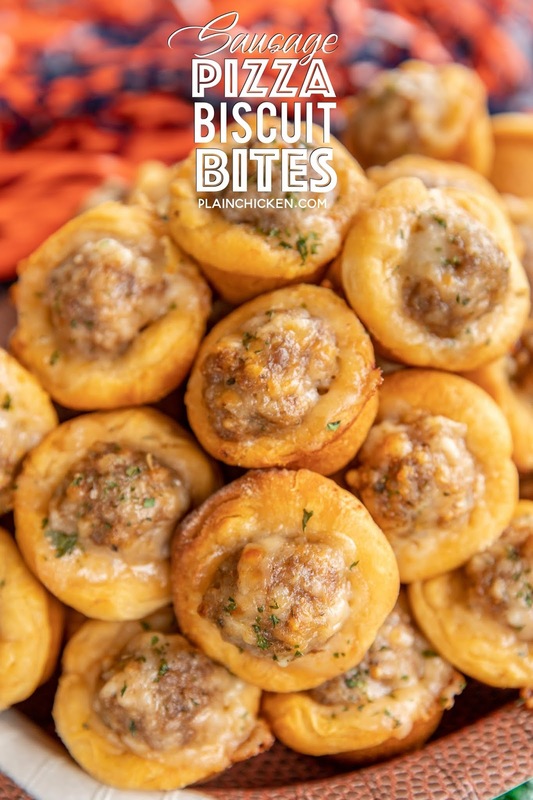 Sausage seasoned with spaghetti seasoning, mozzarella cheese and baked in biscuits. I mean, how can that be bad?!?! Feel free to add some green peppers, onions or mushrooms to the sausage mixture too. 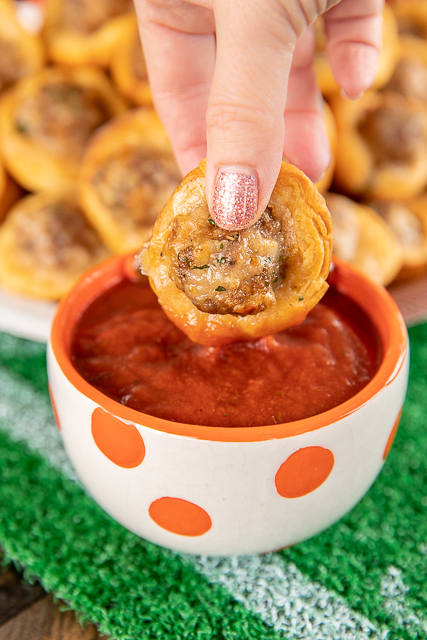 We dipped the bites in some warm pizza sauce. YUM! 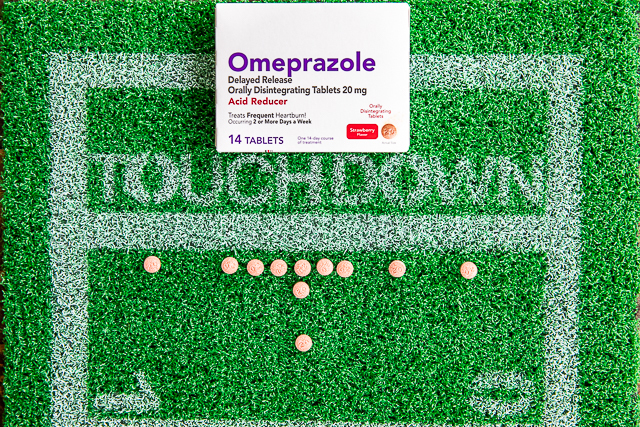 Don't forget your Omeprazole Orally Disintegrating Tablets so you can enjoy all the delicious football food! I've already bought mine. If you’re suffering heartburn two or more days a week, I’d suggest looking into adding Omeprazole Orally Disintegrating Tablets to your routine. It’s a 14-day regimen, taking one dose every 24 hours, that can provide long-lasting relief. You should not take this medication for more than 14 days or more often than every four months unless directed by your doctor. 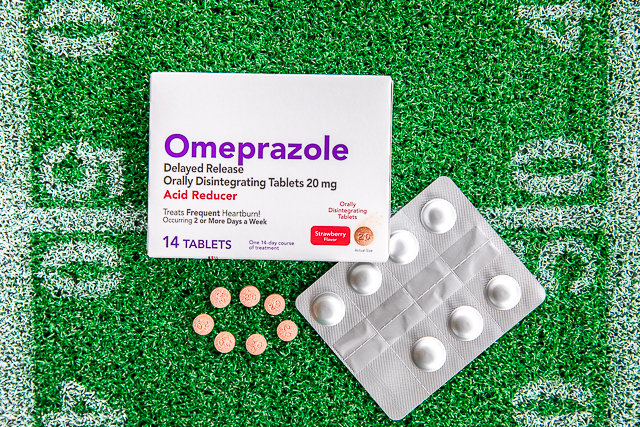 Omeprazole Orally Disintegrating Tablets are not intended for immediate relief and may take 1-4 days to feel the full effect, although some people get complete relief of symptoms within 24 hours. Individual results may vary. Do not dissolve Omeprazole ODT in water or chew it. Preheat oven to 400ºF. Lightly spray MINI muffin pans with cooking spray and set aside. Mix uncooked sausage, spaghetti sauce seasoning, and mozzarella cheese gently, until well blended. Shape into 40 balls of equal size. Remove biscuits from cans and separate each biscuit into two layers, making 40 total biscuit layers. Press one layer of biscuit into cup of lightly greased MINI muffin pan. Repeat with remaining layers. 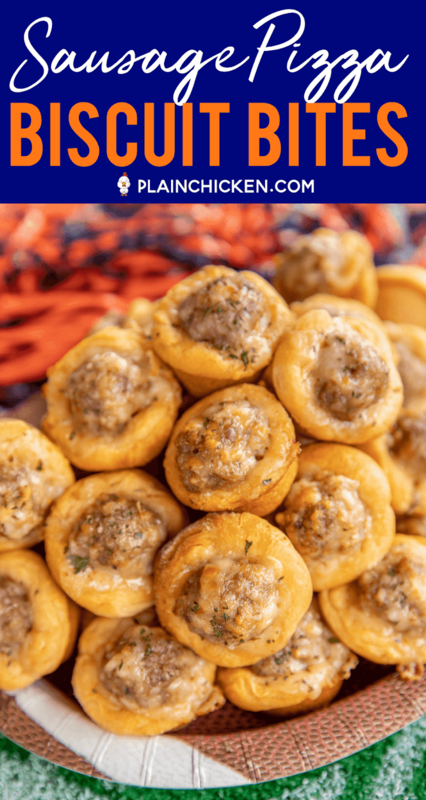 Place sausage-cheese ball in each biscuit cup. Bake for 12 to 15 minutes or until biscuits are browned and sausage balls are bubbly. NOt sure which I love more - Omeprazole or these bites!!! Probably the Omeprazole - so I can eat the bites!! Yum! LOL! Same here! Omeprazole is a life saver for me! What else would go with these beside the sauasage? That would taste good. Could you use turkey sausage ? what spaghetti sauce seasoning do you use? Can you freeze and reheat? How long do you reheat?